But in the midst of discovering that her role in the Hart family may not be as coincidental as she thought, she’s accused of treason and is forced to face her greatest fear. Elsewhere. A prison where no one can escape. As one shocking revelation leads to the next, Kitty learns the hard way that she can trust no one, not even the people she thought were on her side. With her back against the wall, Kitty wants to believe she’ll do whatever it takes to support the rebellion she believes in, but is she prepared to pay the ultimate price? It's been three months since Kitty discovered the Hart family secrets, and now she lives as one of their own. Her name was formerly Kitty Doe, orphan. Plucked off the streets and threatened along with boyfriend Benjy to become the public darling Lila Hart in a society based on lies, conspiracies and a brewing revolution. Daxton Hart is now patriarch of the Hart empire, and unbeknownst to the public, Kitty is his doting niece. But behind the smiles hides a sinister man, a cruel tyrant and an impostor that Kitty is determined to unmask. I wasn't a soldier. I wasn't a strategist. I wasn't a politician. I was nothing more than the face I wore, a face that wasn't even mine. The Blackcoat rebellion has stalled, and it seems even Daxton is one step ahead of the revolutionary band of rebels. The only weapon that Kitty now has at her disposal is Daxton's secret. He's an impostor and without proof, the revolution are fighting a losing battle. Kitty must risk it all to find evidence against Daxon, even against Knox's wishes. If caught, she faces a lifetime in Elsewhere. A place where all hope is lost and those who are seen as uncompliant are hunted for entertainment. Where even Lila Hart couldn't survive. She's now a prisoner of the walled community, her life teetering on the edge while not knowing who to trust. Lives will be lost and the war against an oppressive society is being forged. There is no such thing as a bloodless revolution. 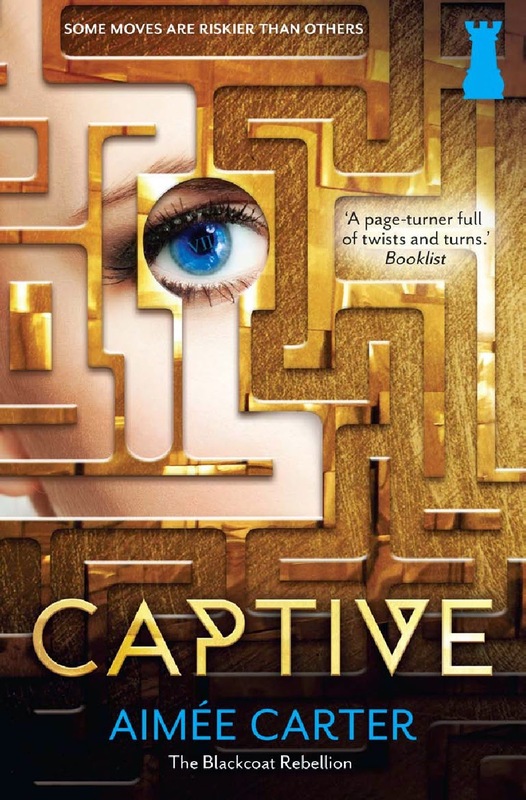 Captive picks up shortly after Pawn, where Kitty has now succumbed to living as Lila Hart, while the real Lila is living amongst the Blackcoats, assumed dead at the hands of her uncle Daxton. Augusta is dead, and Kitty knows that Daxon isn't who he claims to be. After being on the verge of death, he seemingly remembers Kitty's betrayal, while Kitty was rallying supporters for their cause all over the country. Benji is now working as Knox's assistant, until Daxon realises his connection to Kitty. Unless Kitty can find the evidence to prove that Daxon too has been masked, the rebellion will stall and she'll lose leverage over her freedom she so desperately craves. Not as engaging as Pawn, but Captive takes us from the lush surroundings of the Hart empire, to the walled city of Elsewhere as Kitty is imprisoned. These are the lowest members of society, where the only way out is death. No one escapes Elsewhere. It wasn't until I saw a group of prisoners running towards is with weapons drawn that I understood. The rebellion had begun. What left me disappointed, was the lack of character development. Kitty seemed reluctant to help the rebellion, bitter that she was forced to attend lavish parties as Lila while Knox attended the underground meetings of the Blackcoat rebels. She constantly demanded attention, not willing to sacrifice her own ego for the thousands of the oppressed. Living as Lila seemed to have afforded her the social status that the Blackcoats are fighting to abolish. Only aiding the cause if her own demands were met. Where in Pawn she was sassy and fierce, in Captive she seemed sheepish and privileged. Benji continues to play the gentle, doe eyed boyfriend while Knox still remains the mysterious and stoic rebellion leader. What was missing was the intensity. It didn't have the same passion and urgency as Pawn and was drawn out until Kitty reached Elsewhere. That's when the story finally picked up. It was a good sequel, enough to satisfy fans of Pawn and sets the tone for what I hope is an incredible finale. I hope the next one gets better for you, Kelly. Me too Joy. I really enjoyed book one, but sadly this one seemed to fall into the middle book syndrome for the first half, then picked right up and the second half was fantastic. At least it's set the series up for an explosive finale. Fingers crossed. I still enjoyed this one, but I did get a bit frustrated with both Kitty and Knox. The fact that they couldn't just work together and trust each other made me a little crazy! Exactly Nicole, I completely share your frustrations. They just didn't seem to grow or develop from book one, even with a revolution hot on their heels. If anything, Kitty seemed to devolve and enjoy the Lila lifestyle a little too much. I wasn't a huge fan of of Pawn and it was basically an ok read for me so I'm not sure whether I'll pick up Captive any time soon. But the covers are just gorgeous aren't they?! They are! They are probably close to perfect when it comes to the dystopian genre. I didn't mind her in Pawn, but in this one I could barely tolerate her unfortunately. I was almost hoping someone would take her out at one point. It was still good, but the first half definitely fell into the category of middle book syndrome. It was reminiscent of The selection at one point. But thankfully after Kitty was sent to Elsewhere, the storyline really picked up. Character development always seems to flounder a bit in sequels, like all the awesome strides they made in the first book gets halted . . . incredibly frustrating! It does doesn't it. So few have done it well, but luckily the second half really picked up and was able to redeem the storyline and makes you NEED book three just to see what happens. It did. I had such high hopes and wish the action had of come into the storyline much, much sooner. But at least it was there and from halfway through and onwards, I really really enjoyed it. Just wish it had of come sooner. Yes! It's definitely worth the read, especially once the storyline picks up around halfway through. Before that, it reminded me of The Selection, with the lavish parties. At that point I was practically praying for Kitty to be sent Elsewhere. I am still waiting for my copy to arrive, but it never did sadly. I really did love Pawn and was hoping this would be as awesome as the first, but a shame some of the characters tempered out, like Kitty. Lovely review Kelly! I think it's available on Netgalley if it doesn't arrive. I think it fell to middle book syndrome, which is pretty common I've found with most series. The first half wasn't all that great, but the second, brilliant! Still well worth the read Jeann and it sets up for a great finale. Ah damn it. I was really hoping that this book would have more character development since Kitty was so annoying in the first book. I guess I just have to brace myself. Thank you for the honest review Kelly!